2015 marks the 20th anniversary of the Federal Highway Administration Stop Red-Light Running Program. Since 1995, the Federal Highway Administration has used this program to educate the public about the dangers of going through a red light. One of the key components of this initiative is National Stop on Red Week, which occurs during the first week of August each year. According to the Federal Highway Administration, you and your loved ones are more likely to be hurt if a driver goes through a red light than in any other type of accident. Nationally, someone runs a red light at an urban intersection about every 20 minutes. 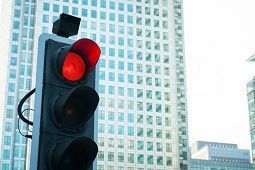 While the majority of drivers recognize that running a red light can be dangerous, about one-third of drivers report running a red light in the last 30 days. Almost 9,000 people have been killed in red light accidents over the past decade. About 165,000 people are injured every year in red light accidents. This sum includes drivers, passengers, motorcyclists, bikers, and pedestrians. Every day there are, on average, seven fatal crashes at intersections that have traffic control lights. About half of the people who die in red light accidents are not the ones who drove through the red light—yet they and their families are the ones who suffer the greatest possible loss. Stop for a yellow light rather than trying to get through the intersection before the light turns. But you can’t do it alone. The government may also help prevent red light accident injuries timing the lights correctly, installing red light cameras, and enforcing stop on red laws. This year National Stop on Red Week will be observed from August 2–8, 2015. During this time we encourage you to take action by sharing this blog post on Facebook and sharing it with your friends. Together, let’s spread the word about the dangers of running a red light and about the steps that we can all take to prevent red light accidents.